There is something very important new about the picture banners and I guess it's a very good thing. As most of you know there are a lot of banners where you can use your own pictures in. Until now your pictures have been resized according the requirements of the specific banner. In case your pictures didn't fit to the picture ratio the banner awaited, it was cut automatically to make it fit. Trimming of your uploaded picture. Just move the rectangle to the position you wish or resize it and press the -take selection- button. Thus it happened from time to time, that the relevant part of the picture, what you wanted to show, was cut off. From now on you have the possibility to crop the relevant section of your picture to be used in your banners. This way you are also able to "zoom� into your pictures until a certain level. For example if you only want to show a face or something like this. There are endless opportunities. The picture here should explain the way it works. By the way, the cropping rectangle will always keep the picture ratio the banner requires. And just a last benefit. My daughter complained that pictures can not be rotated, a really useful suggestion I think and I'm happy to have also this drawback fixed. 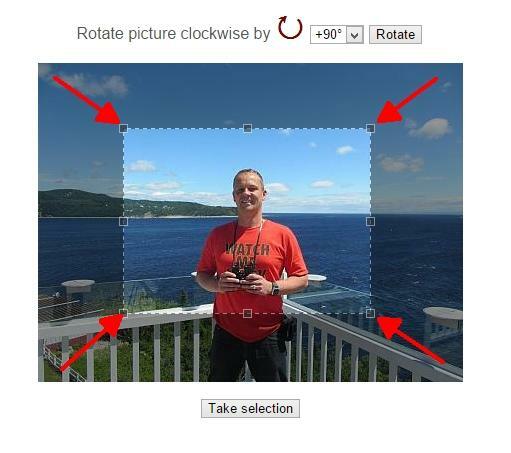 From now on you can rotate pictures by 90�, 180� or 270�.